About a year ago these builders sent a letter of inquiry and some photos of basses they have made. Pictures really do not tell a lot, but they did look great, even if one “vaguely” resembled a Fodera AJ6. I was very intrigued by what these builders might have to offer; they decided to send a bass â€“ it is now here. Our first J&J is certainly not a copy of anything I have seen. A single cut, yes, but a neck-thru with a chambered body. 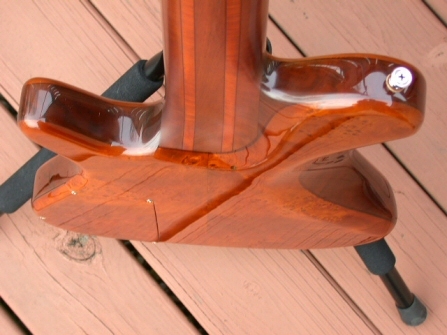 The neck is a 36″, 5 piece neck-thru, two pieces of Flamed Maple, two of Flamed Walnut, and one of Kingwood. The fretboard is Purpleheart. 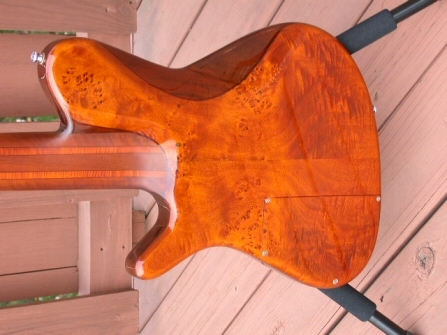 The body consists of chambered Walnut wings with Burl Black Poplar top, back, and headstock veneer. Check out the “nut” – actually patented mono nuts, designed to enhance sustain. The bridge is also a proprietary mono design. 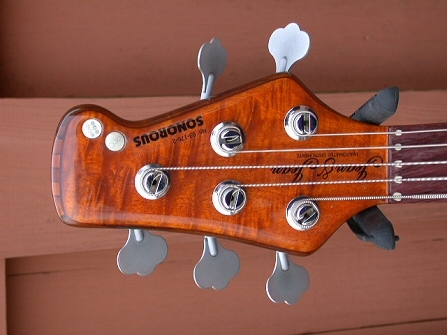 String spacing at the bridge is ( 19mm ). 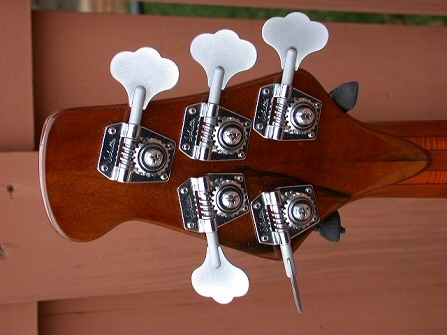 The tuners are by Schaller, with an antiqued finish on the paddles. This is a passive bass ( a preamp may be added ). 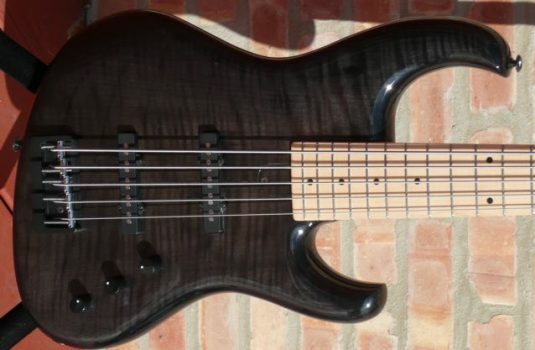 The pickups are by Bartolini. The finish is polyurethane translucent amber, with a satin finish on the neck ( nice touch ). There are 2 volume pots , a coil selector pot ( it works ) and a tone control. The bass has a big, vintage vibe and the chambered body does add to the tone. Plays great and I did not realize it was a 36″ neck till after I played it and read the spec sheet. 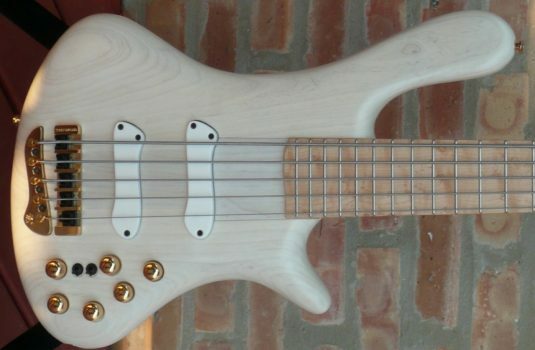 A unique bass of very high quality. I look forward to seeing more basses from Zan Selimanovic and Jovan Ignjatovic at J&J. These fellows have a bright future. NOTE: this bass is a bit neck heavy. 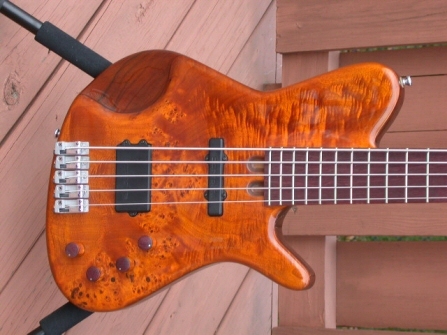 This does not detract from the playability, sound , and appearance of this bass. Still, this cannot be ignored. Comes with gig bag.